Coming into the 2016 school year the Eurocom Education Program offers steep savings for students who need High Performance mobile hardware for High School, College or University. The Eurocom Education program was designed to assist students attain the high performance, fully upgradeable mobile computing hardware they need for their educational endeavor. 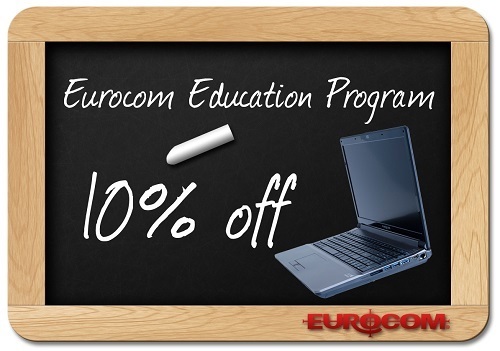 “Any student, anywhere in the world can receive 10% off a Eurocom Desktop Laptop, Ultraportable, Mobile Workstation, Super Gaming Laptop or Mobile Server thanks to the Eurocom Education Program” Mark Bialic, Eurocom President. Students often need the most capable hardware because they require mobility while also needing high performance processing and graphics along with a high quality chassis to last during their studies. At Eurocom, we have designed a fantastically easy to use program for students to leverage in order to help fund the purchase of a new laptop for their education. “Eurocom is extremely pleased with the lives we’ve touched and Educations we’ve improved through the Eurocom Education Program. Students can now receive the capable hardware they need for their studies with the Eurocom Education Program” Mark Bialic, Eurocom President. An education is not something you do for just a week or a few months. As such, students and post-graduates should choose hardware that not only meets the demands of their unique specialization, but hardware that is built for the long-term: not just a few semesters, but years into their chosen career path while in school and beyond. At Eurocom, we have designed a program for students to leverage in order to help fund the purchase of a new laptop for their education. The Eurocom Student program accomplishes the best of both worlds enabling access to our full line of exceptionally performant, long lasting laptops, at a discounted rate available exclusively to students and post graduates.